I get it, Siem Reap is Cambodia‘s tourist draw, and for good reasons, first among all being the stunning Angkor Wat archaeological park nearby. However, the fascinating Southeast Asian country definitely has other cities that are interesting under different points of view, be it historical or to delve deeper into its traditions, such as Battambang, capital of its namesake province. After visiting, here are my suggestions on the best things to do in Battambang should you happen there. All these spots are easy to reach as any tuk-tuk driver will offer you to take you and stay with you for the whole day, and depending on who you find, the trip will be made more precious by the tales and anecdotes the driver will share with you about Cambodia and his own life. No matter how many days you will stay in Battambang, at night do not miss a stroll along the river for a delicious and ridiculously cheap Cambodian dinner followed by the intense taste of local milky coconut, apparently typical from Battambang, with an incredibly thick and flavorful meat. Many are the things to do in Battambang because in this fast developing tourist destination, not only Siem Reap is worth a trip. 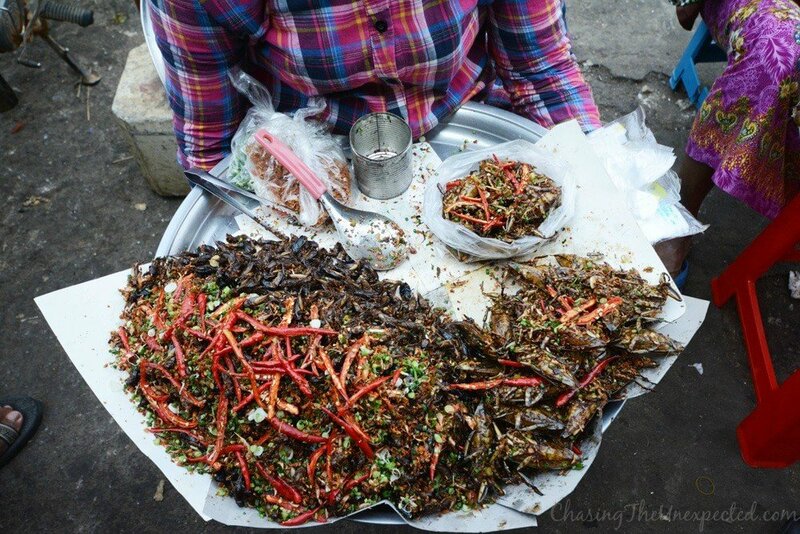 The first thing I would recommend is to visit Battambang’s local market. Aa real explosion of colours, sounds, and smells, in a nutshell, of daily-life moments, this is definitely one of the best places to visit in Battambang. 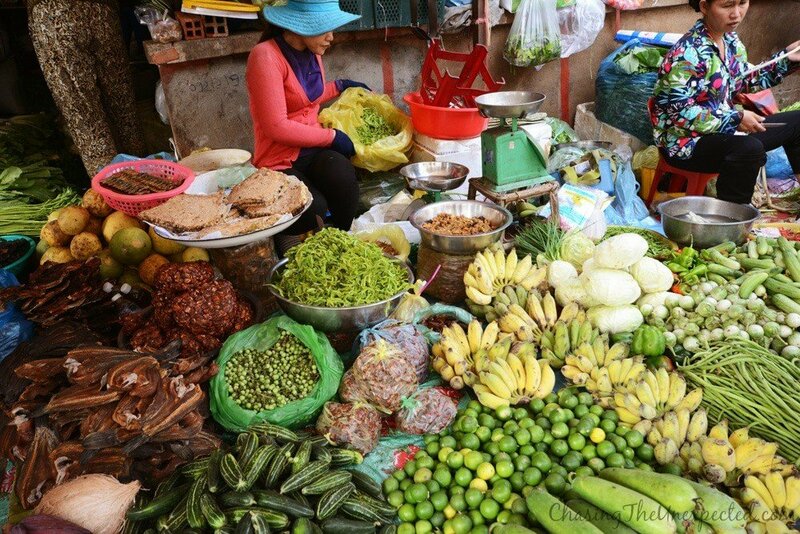 It’s the type of place where you can find anything you are looking for and more, from tailors who can sew and fix your clothes, food to take away, fresh fruits and veggies, fish, eggs, grasshoppers and all sorts of Cambodian delicacies. Maybe instead of bamboo “train”, it can be called bamboo “wagon” as you’ll be travelling on single carriages. 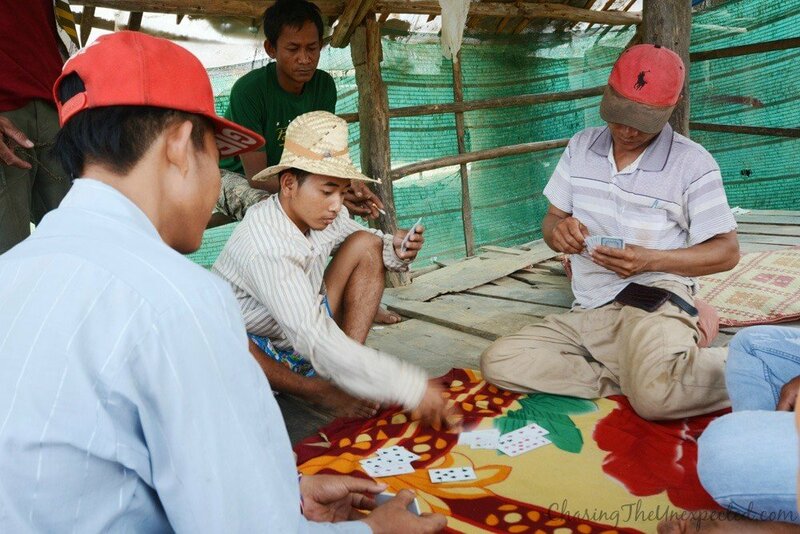 Albeit engine-based rather than ox-drawn ones, it’s definitely one of the best things to do in Battambang. Running along the ancient railways not operative anymore, you will inevitably go past traditional villages, meet locals playing cards and watching the never-missing TV, drink freshly squeezed sugarcane juice and, obviously, be literally immersed in unspoiled nature. 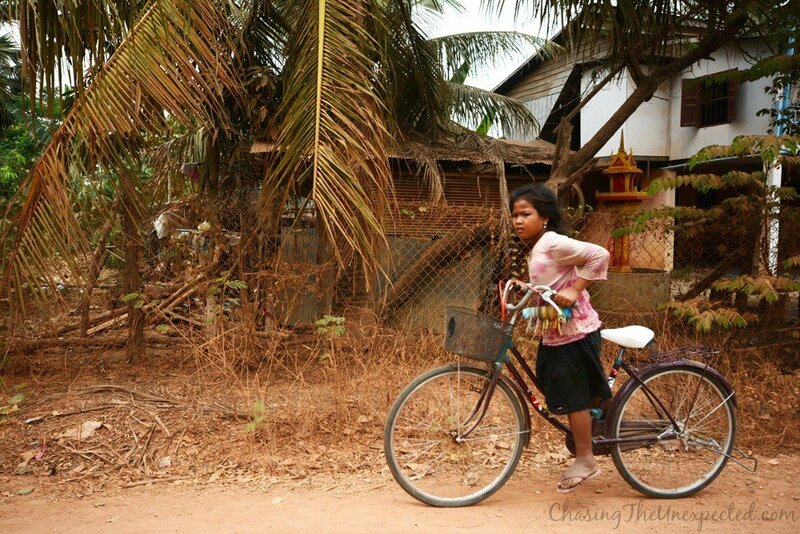 ⇒ Extra tip: Click here to book a day trip from Siem Reap to Battambang. 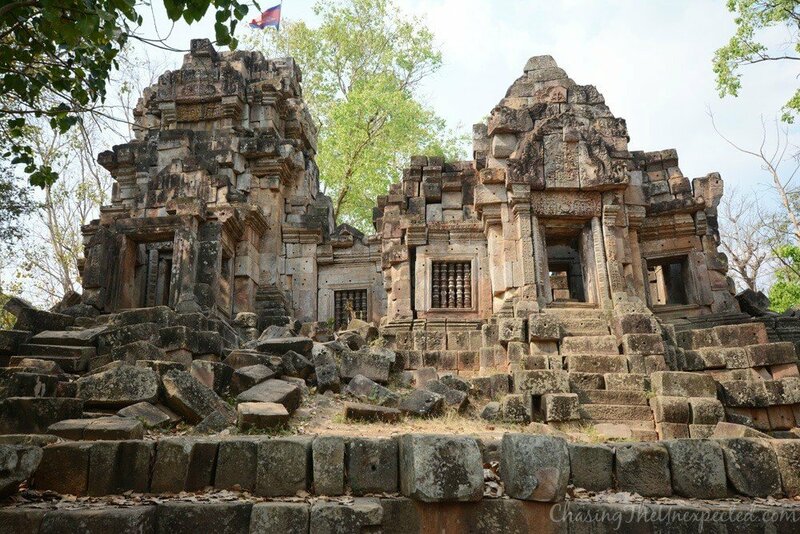 Among the things to do in Battambang, there is a temple complex beside a painfully notorious site belonging to Cambodian modern history at about 14 km from the city. All throughout my trip, the years under the Khmer Rouge rule were some sort of leitmotif, a tragic theme that occurred every now and then. 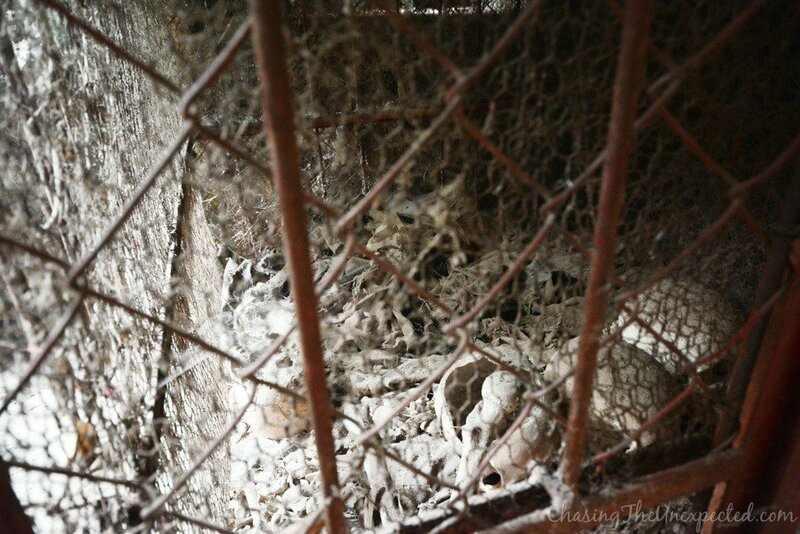 Here, there are what have been called “killing or death caves”, where it is said the Khmer Rouge officials used to drop the bodies of the people they had either just killed or to kill them altogether. Former Buddhist site then used as killing caves, now the place has been restored to its original function yet keeping alive the mark of the country’s tragic past with a display of bones and skulls on the bottom of the cave. Temple at Phnom Sampeau, one of the top attractions in Battambang, Cambodia. 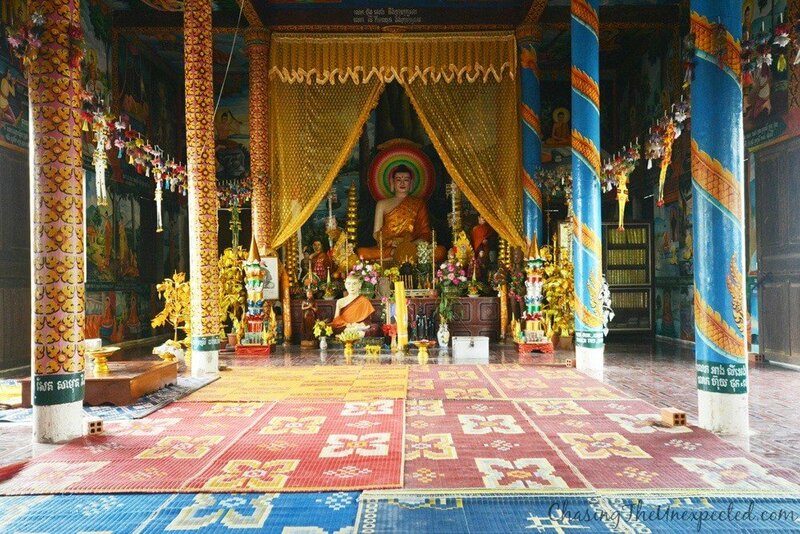 If you are still wondering what to do in Battambang, located some 10 km from the city, Ek Phnom temple is a must-see. 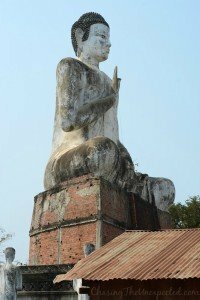 A huge statue of a white-stone sitting Buddha welcomes the visitors and leads them to a new, over-decorated pagoda that opens the way to the ruins of the ancient Wat Ek Phnom, dating back to the Bayon period. Beautiful carvings and temple life surrounded by an almost untouched nature complete the rural Cambodia scene enhanced by monks’ orange tunics hanging here and there to dry and locals working on the banks of the river. I really enjoy this tour and I totally recommend it among the places to visit in Battambang. 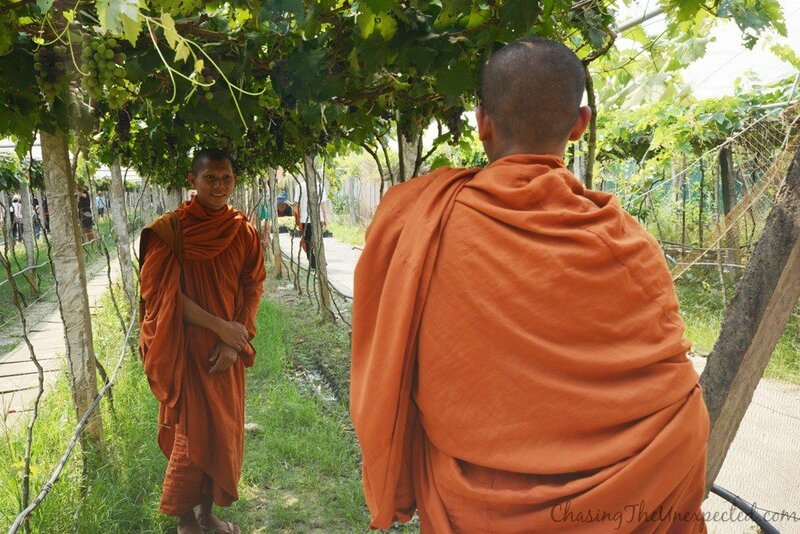 I know, monks instead of grapes, but they looked so happy. Besides, they are surrounded by rows of grapevines! Who doesn’t like a good glass of wine? That’s right, wineries can be visited in Cambodia too, not only in Italy and France! 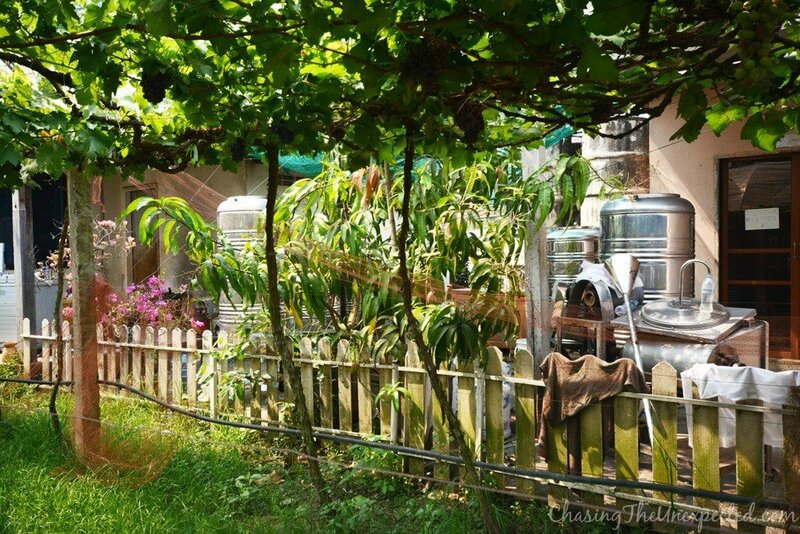 Cambodian wines might be different from European ones, but the experience of seeing the place where the grape juice is produced is worth a stop at Battambang’s only winery. Walk along the cute grape-lined vineyards and enjoy a chat with locals and tourists, all made more cheerful probably by the eventuality of a future wine tasting. Do you want to experience the magnificent country of Cambodia with a reliable tour agency? If yes, then you are lucky because GAdventures does excellent 7-15 Days Tours across Cambodia to show you the colours, history, and culture of this beautiful country. Click here to see the details and the latest prices of the multi-days Cambodia tours. If you are lucky enough, you can witness on a wedding ritual on the street. Cambodia is probably the country where I’ve seen the highest concentration of weddings. Colourful, loud and cheerful, on the last day we were finally drawn into one and took part in the dances. 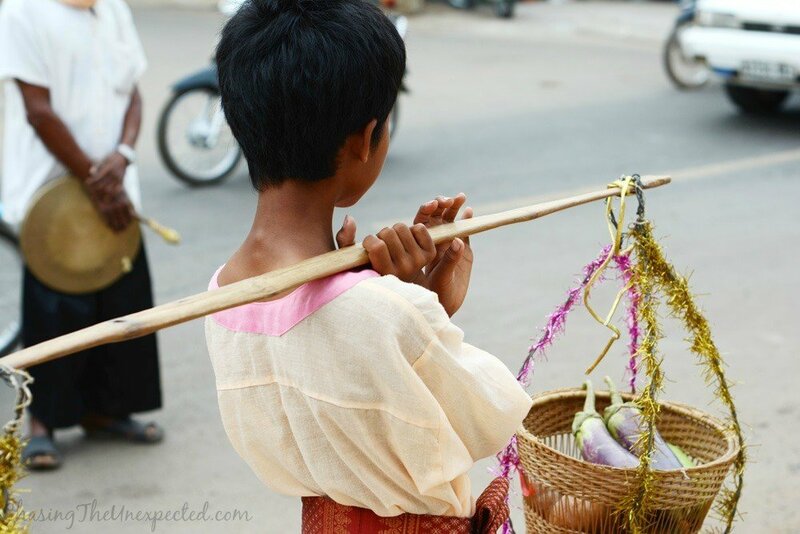 The morning we were leaving Battambang, we stumbled on a morning wedding ritual where the groom is in charge of sourcing 36 different types of fruits and veggies that his guests carry in a parade and offer to the bride on the wedding day to wish the new couple wealth and prosperity. They were a colourful and slow parade made of children, women, men and the elderly, all of them dressed up for the upcoming party and bringing something to the bride. Accommodations in Cambodia can be very good and very affordable. Check out our suggestions for the best hotels in Battambang in case you decide to explore this lovely city for more than one day. In the city centre of Battambang with peaceful and good sized clean rooms and nice facilities such as pool and a garden. Click here for the reviews and latest rates. If you are looking for a good budget hotel with good services in Battambang, the Royal Hotel is one of your best picks. If you are lucky, you might find rooms for as little as 13 USD per night. It’s a little bit pricey (Cambodian pricey not western) and it’s totally worth it. Sangker Villa is a little French-run hotel with friendly staff, delicious breakfast, nice light pool for the night swim, homemade foods and drinks. It is a top rated villa in Battambang with good location close to Battambang city centre, services and facilities inside the villa. Nice clean pool, big rooms and bathrooms, excellent breakfast, and good quality food if you want to eat in the hotel. 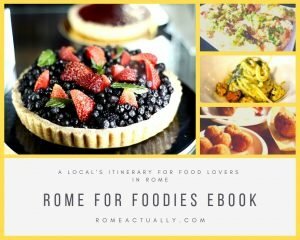 Trés interessant, texte super et superbes photos!